Bank of America has revealed progress on a blockchain application designed to make it easier for global treasuries to do business with new customers. At a Microsoft event last week, Bank of America’s director of trade and supply chain finance, Ann McCormick, showcased a new version of the ethereum-based application, demoing how it automates the process of creating a standby letter of credit. A type of guarantee crucial for creating trust between new business clients, the letters are being encoded on a blockchain as part of the trial with the help of Microsoft Azure’s blockchain-as-a-service sandbox. In essence, instead of letters being manually sent between multiple parties, they are being translated into smart contracts on a private version of ethereum blockchain. However, it turns out the work with Microsoft is about more that just building a technological solution for a given problem. McCormick argued that Microsoft’s diverse set of clients could help accelerate adoption of blockchain tech by new users. McCormick acknowledged, though, that achieving widespread adoption of any new service isn’t merely technological – it’s also about knowing who is interested in using the tech, and who might already be capable of doing so. For that, McCormick said Microsoft and Bank of America have been leveraging their corporate client networks to better understand where synergies might exist. Also called a ‘payment of last resort’, a standby letter of credit is a guarantee of payment by an issuing bank on behalf of the applicant to a beneficiary. But in the current, complicated process, multiple parties can only contribute to the letter after others have done so. This means errors and inaccuracies can remain undetected until the final issuer – in this case Bank of America – reviews the documentation. This is what McCormick calls the “spaghetti world” of finance, because if a problem is discovered the entire process must start again from the beginning. 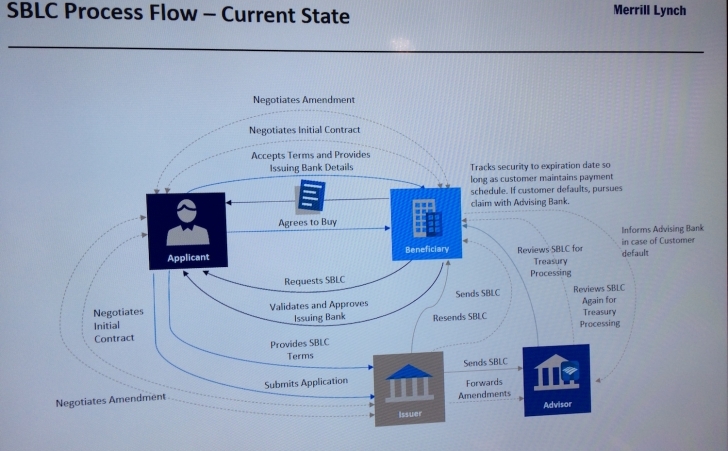 Instead, Bank of America’s ethereum solution moves the entire process to a single, self-executing smart contract. The problem the blockchain solution is designed to tackle is that Microsoft Treasury – which acts as a kind of in-house bank for the tech giant and was recently valued at $120bn – has over 1,000 different bank accounts held by many more providers than just Bank of America. Further, Bank of America issues letters of credit to a wide range of potential suppliers. To really capitalize on the network effects of moving such a work flow to a blockchain, more banks would need to use the service and more suppliers would need to be able to tap into the tech. This is where interoperability could really come into play. For example, last year Bank of America teamed up with HSBC to launch a blockchain supply chain project built using Hyperledger, a Linux-led consortium that manages different blockchain codebases. Then, earlier this year Microsoft became one of founding members of the Enterprise Ethereum Alliance, an alternative private blockchain software system. As a result, the fragmentation of traditional finance is increasingly being mirrored in blockchain, further making it likely that each solution will need to be able interoperate with the others. Still, addressing the potential issues starts with recognizing that compatibility is a likely next step.